Whether it is fair or not, every review written for a PlayStation Vita game must consider two things: Is it a good game? And if it isn't, is it good enough to fill the gaping holes in Sony's release calendar? The lack of a steady stream of new Vita games, and an almost blank checklist of games coming soon, means that not only must one consider a game on its merits; they must temper that with the knowledge that there isn't much else out there to play. While I truly enjoyed games like Earth Defense Force 2017 Portable and Uncharted: Golden Abyss, I would be lying if I said they would have gotten the same attention had they been on a well-fed portable or long-established home console. That is what makes Sly Cooper: Thieves in Time so special in my eyes; not only is it a good game for the PlayStation Vita, it's also a good game - period. I didn't have much experience with the Sly Cooper series going into this, the fourth game starring the raccoon robber. Luckily, that didn't seem to matter much. The plot is easily digestible and allows for some pretty refreshing and dramatic shifts in scope and gameplay. Sly, who has given up his thieving ways, gets dragged back into his old profession when someone or something begins erasing his family's history from a book called the Thievius Raccoonus. So he and his pals Bentley, a turtle in a wheelchair so filled with gadgets it would make Professor X jealous, and Murray, a huge pink hippo with a penchant for busting heads, use their time machine van (why not?) to jump through history, helping various Cooper ancestors and trying to track down their shadowy tormentor. The time-traveling plot point is a great jumping off point, and it ensures that once you begin to get bored, you know a huge shift in scenery and gameplay is right around the corner. An introductory, present day tutorial level, for example, gives way to a series of missions in ancient Japan, which then turns into the Wild West, which soon introduces the Stone Age; you get the picture. What keeps things even fresher is that each time period comes with a new playable character and costume. The playable characters, members of the Cooper lineage, all have specific special powers and twist the reliable third person action in some cool ways. Rioichi, Sly's namesake from Japan, can use a "ninja jump" to bound from vantage point to vantage point, while Salim al Kupar, the Cooper from the Middle East, can summon a magic carpet. And with each time period's new ancestor, you'll still play missions as the three main characters, meaning there is a lot to do and a lot of characters to learn and master. Which segues us nicely into the costumes. Each time period has a costume to collect, and all have various perks. What is nice about these is that they can be used in levels you've already completed, usually as a means to finding some of the game's mountain of collectibles. For example, take the archer costume back to Japan and you'll be able to find the time period's elusive final treasures. Keeping the costumes tied to their time would have felt like they were tossed into the mix in an overly gimmicky way, but they avoid that trap by becoming valuable through many different parts of the adventure. My only gripes with the costume system are that switching in and out of them can be frustrating slow and some of the powers just don't make sense. Both these beefs go with the samurai costume, so I'll use that as my example. Though swapping from regular Sly to Samurai Sly is done with a quick tap of the touch screen, it comes with a seconds-long animation that makes switching more cumbersome than it should be, especially during the boss fight in which you'll need it. And could someone explain why golden samurai armor's perk is that it is immune to fire? How does that work, or even make sense? "Oh, hey - check out my new headband! It protects me from computer viruses and tigers." The perks should make sense with the costumes they are attached to, and sometimes Sly's don't quite do it. Now let's talk about how the game's presentation. First things first: The Vita version does not look as nice as the PS3 version. That said, it is still graphically impressive. The cel-shaded look has always been one I like, and Sly Cooper nails it. As expected, the PS3 version of the game does look noticeably better (more on this version in a moment), but the Vita game is no slouch. There are a few nagging issues, though; the cutscenes can have that blocky, low-res, deinterlaced look to them and you will absolutely notice some slowdown in larger areas overflowing with enemies, but neither will be enough to break the average gamer's bond with the overall adventure. The PS3 owner or super fussy gamer may find fault, but not this reviewer. Sly Cooper isn't the most impressive looking Vita game, but it is definitely in the top five. Being so closely tied to the PS3 version is a blessing and a curse for Sly. Purchasing the PS3 version, on the PSN Store or in some retail establishment, gives players access to the Vita version for the low, low price of nothing, the latest godsend in Sony's not-nearly-popular-enough Crossbuy program. Unfortunately, it doesn't work the other way around; buying the Vita version doesn't automatically give you access to the PS3 version. The cross save feature is implemented well, meaning you can play the game on the Vita, save to the cloud and pick up where you left off in the PS3 version and vice versa. As cool as this is, it works against the Vita as the console title is so much better looking. In addition, the PS3 load times are much shorter, with the Vita version requiring upwards of a whole 60 seconds to load a new level and about half that to enter your hideout or accept a new mission. The PS3 version is shown to be the superior one when using Crossbuy and cloud saves, but that doesn't mean anyone should shy away from giving the Vita version a try. It is free with the PS3 title, after all. No one can argue with free. With so many console and handheld titles focusing their energies on being the bloodiest, most gruesome spectacles they possibly can be, it is welcome to see a third-person platformer turn out so well. Sly Cooper's Vita outing (and by extension his PS3 one, too), finds its greatest strengths lie in its variety and the simple joys of running, jumping, hunting for items and fighting anthropomorphic animal bad guys. Final Rating: 88%. 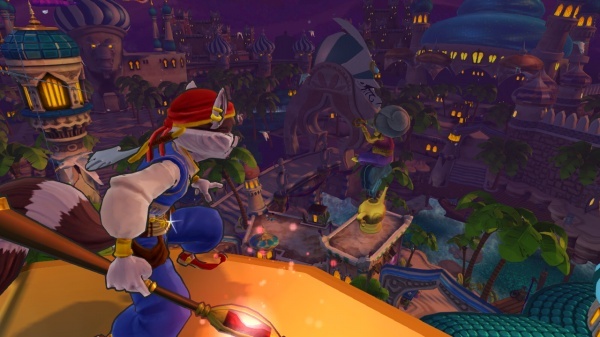 In a Call of Duty world, Sly Cooper is 2013's first unexpected breath of fresh, universally appealing air.